You should be able to determine which version of your program is running. Run it! I dare you! One of these downloads is a multi-megabyte OpenGL-based warfare simulation in which theories of warfare can be tested and refined without the need for actual hostilities, including not only military but also political and social factors, seen as inextricably entwined in a realistic warfare model . mystery-application.exe is not a valid Win32 application. OR IS IT? These are, of course, two versions of the exact same piece of software; the only difference between them is that in one I’ve converted the PE COFF machine identifier to be a 7. What I’m attempting to illustrate here is how extraordinarily brittle software is as a whole, and how knowing which version of an application an end-user is running is fairly significant when attempting to determine what the problem is at any particular point in time  . It’s also an illustration of how pissed off I get when my State Government decides to spend over a billion Australian dollars on replacing a payroll system that worked perfectly well, but apparently no-one knew how to add a new employee to it or something. This stuff doesn’t rust, people. Software artifacts are different from physical artifacts. In nature, you can usually break a twig without killing the tree, but this isn’t true of software, most instances of which will fall into a heap if you breathe on them the wrong way. Some developers attempt to minimise these ‘single points of failure’ by creating hideously complex design patterns, but I should probably leave that rant for another time. Some people believe that you will receive 72 versions after you go jihadding. They should work in IT. Ahahaha. It’s usually the first question that any IT support person will ask, because if you don’t know what version you’re running, then you don’t have a baseline from which to work out what to change to fix whatever problem you’re having . If you were the sort of person who over-dramatises things, you can think of it as being similar to the fire brigade asking what building you’re in when you ring them up complaining that the air is a bit thick today. Just before they enter your address into some kind of computer system. Which is definitely working. Microsoft desktop applications normally shove this under the Help → About dialog, command-line programs normally have a -v or -? switch, but webapps don’t have a standard for it. Microsoft also believes that you should store version numbers in content type headers, meta tags, document type declarations, and four or five places in the registry, but let’s ignore that for the time being. “Yes”, you may say, “but everyone using a webapp is by definition using the same version of the webapp”, and well you might, you handsome devil you, but you haven’t considered internally-deployed webapps, or worked in a overly-bureaucratic or security-conscious organisation that considers that kind of information too difficult to retrieve or confidential, and you don’t have hundreds of the bloody things scattered over the net. where the bamboo.xxxx keys return their equivalent Bamboo global variable values, and the maven.xxxx keys return their equivalent maven implicit property values. You can, for example, see what happens when you click on www.randomnoun.com/version, which will tell you which version this site is currently running. The bamboo version data is useful for DEV and TST environments, where I normally run snapshot artifacts, and the maven version data is useful for XPT and PRD environments, where I normally run full releases. 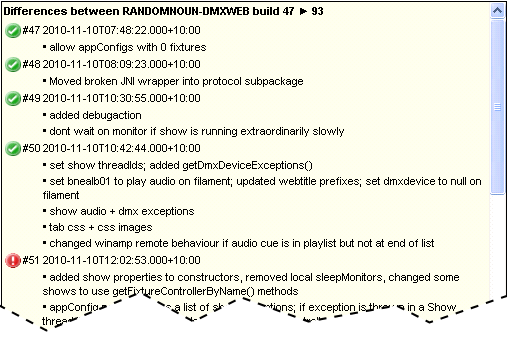 Cropped representation of the differences between dmx-web in TST (build 93) and dmx-web in XPT (build 47). These are the changes that will be migrated if the TST build is migrated to XPT. Each bullet point represents a checkin into CVS, the green ticks represent successful bamboo builds and the red exclamation mark represents a failed bamboo build. * variety of forms. Probably JSON for starters. * mechanism, then remove it from the Properties object. So everyone start doing that, and then you’ll be able to more easily turn back time, which is what you’ll need to be able to do once Sam in accounts discovers how to modify his own payroll or something. This class is now part of the com.randomnoun.common:common-public artifact, which can be directly referenced in your pom.xml from the maven central repository. Also, hopefully, how easy it is to get people to run programs they’ve downloaded off the internet, thereby negating the efforts of the entire software security industry. Bonus points: stop your computer from thinking about elephants. I’m assuming for the moment here that you have a problem with the software that you’re using / writing.